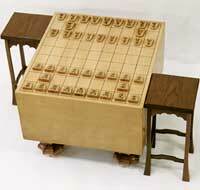 Shogi is a Japanese board game for two players that evolved into its present form more than 500 years ago. Each player starts with 20 pieces and moves them around the board with the aim of capturing their opponent's king. The board has 81 squares, divided into nine rows and nine columns. The pieces all have the same pentagon shape and are inscribed with a kanji (Chinese character) denoting their rank. The rules of shogi resemble those of chess in all but one major respect: In shogi, a player can capture an opponent's piece and put it back into play as their own. 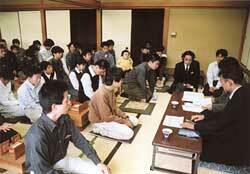 Admission into Shoreikai is based on the results of a written test and a competition among applicants. Applicants must first win four out of six games in the competition. If they are successful, they then play against three Shoreikai members. Victory in one of these games gains them admission to Shoreikai. In 2004, a total of 67 youngsters aged 19 and under applied to Shoreikai's Tokyo and Osaka offices. Only 19 survived the rigorous competition and were accepted for membership. Shoreikai has 150 members. Twice a month, they take a day off from school, go to Shoreikai's Tokyo or Osaka shogi centers, and play from morning until night. As members, they improve their skills not only by playing shogi but also by recording the moves of games and teaching beginners. To graduate from Shoreikai and become a professional, a player must have at least a fourth dan ranking. Professionals make a living by winning prize money from tournaments and earning appearance fees. Winning promotion to the fourth dan is not easy, however. Upon reaching third dan, players compete in a six-month-long tournament. Only the two with the best records earn promotion to fourth dan. Aspiring professionals must also compete against time limits. Shoreikai members who do not win promotion to first dan by the time they are 21 and do not become professional by the age of 30 must withdraw from the organization. Sae must work her way up through the ranks, from her current position in the sixth kyu to the first kyu and then on to the first, second, and third dan. Today there are 50 women in Japan who compete against other women as shogi masters. Of these, 11 managed to gain entry to Shoreikai. None, however, ranks higher than a first dan. Until now, no woman has ever managed to become a shogi professional and compete with men at this level. Will Sae be able to win a place as a professional? Right now, hopes are running high that she will. But the road ahead is long, and she will have to wage her battle alone. Shoreikai's other members are all boys, and most are older than her. Sae will have to compete against them - and emerge victorious - to succeed.